Vineman was my first iron distance triathlon and only my 4th triathlon ever. In my previous races I was nervous and anxious before the race and had doubts...could I do this? Thanks to Brian's guidance this was not the case for Vineman. On race day I was relaxed because I knew I was ready...it was simply a question of whether I would finish in the lower or upper range of my target. Making me write down my race day nutrition plan when through verbal discussion Brian realized I was all over the map. The result was I got off the bike feeling energized and fresh. Telling me to target a 15% improvement on my half marathon PR at the La Jolla Half--to which I replied "Brian, you realize there are hills on this course?" The result: a half marathon PR at La Jolla. When I had achilles soreness during the high volume portion of the training Brian recommended aqua-running. The result was the soreness cleared up in 2 weeks and I was right back on pace and schedule for my long runs. In the end, at the starting line I was ready and prepared. 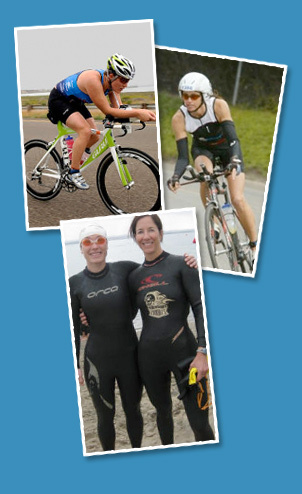 Beyond Vineman, I learned from Brian training techniques that have enabled me to continue to get faster and stronger in the three triathlon disciplines. Come June, I was stronger and faster than I’d ever been–not only on the bike but also in the pool and on the run. It was very exciting and I was prepared for Ironman Coeur d’Alene. But Ironman can be a fickle race, and although I PR’d by 25 minutes and had strong swim and bike legs, I was bitterly disappointed with my run. The worst part was calling Brian after the race because I felt as if I had let him and myself down. Brian agreed that I could have put together a stronger run. He suggested that perhaps I had psyched myself out and lacked a little mental toughness on the run, but he also encouraged me to look at all the positives from the race and reminded me that I had reached 90% of my goal. This was a critical conversation and a turning point in our coach-athlete relationship, although I didn’t realize it then. Looking back, I am so grateful that Brian wasn’t completely satisfied with my performance and that he challenged me to examine my own mental toughness. At the time, I was a little pissed--who was he to tell me that I had psyched myself out or that I lacked mental toughness? I thought to myself, I am mentally tough….aren’t I? The 620 mile ride was by far the most difficult thing, physically, I have ever done. I struggled daily from the second day to the seventh. However, with eleven hours on a bike, I had a lot of time to reflect on the training I had done. I knew, without a doubt, that I had done everything I could to prepare for this ride and there was no way I could have pulled it off without Brian’s help. If I had been left to my own devices, I would have been grossly unprepared and most likely disappointed with my results. Brian is the most sensitive, responsible, attentive, scientific, cooperative, available and FUN coach I have ever had...and I have have been a competitive triathlete for longer than most of you have been alive! I had never used a coach - I thought coaches were just for elite athletes or those with lots of money. But being pretty new to triathlon, I recognized that I needed help with the swim if I was to finish an Ironman. I quickly came to learn that I had been wrong on both of my reasons for not using a coach - I wish I had known sooner! Brian and Rachel were simply awesome. Not all elite athletes are great coaches, but Rachel certainly is! She's such a fast swimmer that throughout every lesson, she would swim circles around and under me to view my stroke from all angles, AND move my arms and legs to where they needed to be! At my just-completed Ironman Arizona, I finished the swim ahead of expectations and it felt EFFORTLESS! And working with Brian? Very easy - I felt like I'd known him for years. He was fantastic at dialing in the right workouts across all sports throughout the weeks, monitoring all of my workouts and races, breaking down the data, offering excellent feedback, providing motivation throughout the highs and lows, and taking the time to learn and understand exactly what I needed from a coach. I was very surprised to find that in a relatively short amount of time, my bike and run times improved significantly. I arrived at the IMAZ start line totally confident that I was going to have a good day. I completed it, met all three of my goals (including running the whole marathon), and had the time of my life. Brian and Rachel rock! I’ve been a National Academy of Sports Medicine certified personal trainer for six years now and have trained hundreds of clients. I am used to cringing while listening to “experts” explain “THE ONLY TRAINING PROGRAM IN THE WORLD THAT WORKS”, filled with physiological exercise myths, half-truths, and misguided, unsafe advice. It was refreshing working with Brian because he knows what he is talking about. Not only does he understand the physiology behind training, but he also knows that sometimes it’s better to do a workout that a person would enjoy more than the most physiologically advantageous one. Every week for 12 weeks, my email inbox pinged with a weekly training plan from Brian. Nearly every week, the numbers, both in distance and time, seemed impossible to me. But nearly every week, I was able to meet or beat those numbers. Brian knew my limits better than I did and designed a plan specific to my wants, needs and abilities. I saw consistent improvement, felt a sense of accomplishment each week and, most importantly, stayed injury free. Coach Brian is a thoughtful triathlete. This translates very well into his coaching style. Yes, you'll swim, bike, and run, but his analytical process to these sports are what sets him apart. He knows how to break it down, and is always searching for new ways to maximize one's performance without reinventing the box. Like all great coaches, he motivates, inspires, and leads. From the technical aspects of progression to efficiency to mental states and nutrition; it's all on target. You won't be disappointed with his personal attention to detail. Yet he has a "life happens" attitude that makes for a flexible plan. His statement "Train smarter, not harder" is right on point and I believe fully in his style of coaching. Brian understands the science behind each workout. He breaks it down and applies it to my training for the week so that I don’t have to. I used to dread the track and never did bike speed work. Now I actually look forward to my intervals and feel the progress I’m making. Long slow distance may help maintain endurance and burn calories, but it won’t make me faster, and it’s time-consuming. My whole strategy has been revamped, and I can feel the difference it makes. Being new to triathlons, and after spending quite a few months swimming with a Masters program and many ocean group swims, I still had a feeling of minimal if any improvement with my swim. I met Brian at a open swim and vented my frustrations. I received the aura that Brian was really engaged in our conversation and not knowing me from the man on the moon, he took the extra time to chat with me. I asked for some advice, which he was very will to give. He also brought up an option to join in a small private class that he and Rachel Gordon were offering with a focus on technique. I thought it over for a week, all the while thinking great, ANOTHER class, but decided I was so desperate I would give it a go. Today, that 2 hour private class was the best decision towards improvement that I could have ever made. Rachel had a unique way to make me feel very comfortable, while still being honest. She broke the swim down to the basics in a manner so I would understand not only how to swim correctly but ,more important, how to detect and make self corrections on my own. Rachel did not just sit on the side barking instructions, she was in the water and swam with everyone individually so we all could see and feel our own corrections. It took Rachel 2 minutes to detect my largest flaws. Not only that, but she went the extra mile to send me an email with the corrections to keep in mind. Well, thanks to Rachel my improvement has been tenfold. Not only have I had personal best swim times in each race since, I now get out of the water with energy and focus on the rest of the race that I have never felt before, all thanks to Brian, Rachel and sense of caring for the individual that they bring. When I raced my first marathon I spent so much time before and during the race visiting porta-johns because my stomach was in knots...I was just so nervous... Afterward I discussed this nervousness with Brian (not realizing it could be my nutrition plan). After a detailed question and answer review (just like a doctor) of my eating habits the days before the race and the morning of my race, Brian figured out that maybe the nerves would not go away but with the correct nutrition plan maybe I could stop the trips to the porta-johns." For my next few races, Brian gave me a very detailed nutrition plan for the upcoming race weekends, also including the exact times and mile markers to take gels and liquids during the race so that I did not over or under absorb needed calories. In just my second marathon his plan worked to a "T" and let me run to my potential--I blew away my PR and qualified for the Boston Marathon! Brian has an especially good way of seeing what the needs of people are and fitting into those needs. He has a good common-sense approach that is clear yet not heavy handed. In addition, he just has a friendly way about him that is easy to associate with. I've seen him demonstrate this time after time on our many miles of bike riding. In an attempt to get more out of my training (okay, truth be told, in an attempt to get faster...) I've decided to take the leap into power. In the right hands the power meter offers so much potential for fine tuning training and racing goals. Brian is a master of data and its interpretation. His attention to detail as well as his grasp of overall data trends has had amazing results in other athletes. With his guidance I'm excited to refine my training and create new training sessions and speed goals. Brian is very realistic about your abilities and he will give you all “the tools” to make you better. He is always there for you rain or shine. There really are no words to thank you enough Brian. You have given me a new life style and I’m loving it! Overall, you were in the top 9.5% of the field, racing at 86.6% of the winners' speeds. Your swim was in the top 29% of the field, at 75% of the speed of the fastest swimmers. Your bike was in the top 16% of the field, 86% of the speed of the fastest cyclists. Your run was in top 18% of the field, 74% of the speed of the fastest runners. The 2nd place guy in your AG beat you by about 3 minutes-- 30 seconds on the swim, 2:30 on the bike, 1:00 on the run. But you were over a minute faster in transition! Looks like you had a good solid race all around. Good work on holding back a little on the bike to have a strong run. It probably paid off. Other than those few sprinters, you were right up there. Your consistency across all of the legs is a great sign--very balanced!" Furthermore, Brian has really helped me in my struggle to balance racing with a busy family life. I used to get anxious about race preparation but under his guidance I can worry less and race fast.